Learning from books isn’t for everybody. If you’ve tried to learn Excel from a book and given up you’ll love these video courses. While these video courses have been designed as stand-alone products, they are also available as printed books or e-books. Many learners find it useful to use the two together. The books also provide a useful indexed reference to keep by your computer once you’ve learned Excel. 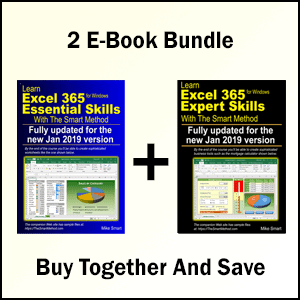 This bundle contains both the Essential Skills and Expert Skills video courses, which will take you from being a complete beginner to a master of every Excel 2007 feature. 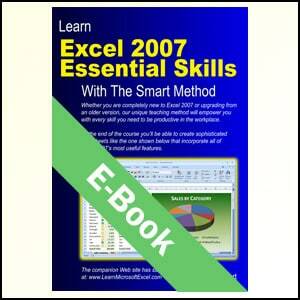 The videos provide the fastest possible route to master Excel 2007. 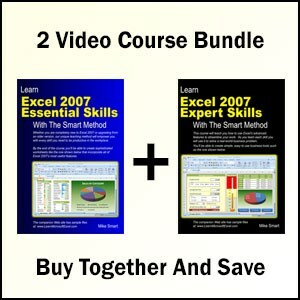 This complete bundle contains has 249 video lessons, with a running total running time of over 21 hours. 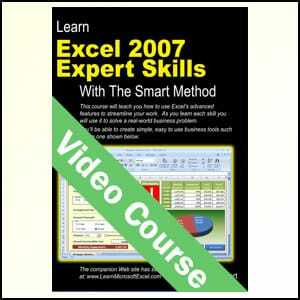 Absolutely anybody can learn Excel 2007 using these video courses. You will be gently introduced to all of Excel’s most important features. Everything is explained clearly, slowly and simply, from the very beginning.